What Comes First When Painting, the Walls or the Trim? It's one of life's great (or at least persistent) questions, and one that many people assume has a clear answer. Well, there is indeed an answer, and it probably will be clear to you once you give it some thought. But the fact is, the right answer depends on your situation and preference. That is, the answer comes from within, my child. Consider the following factors, and your answer may be clear. you're using tape. Most amateurs like to tape off the areas where they don't want to get paint. With its smooth, sharp edges, trim is easier to apply tape to than walls, especially when the walls are textured. you're not using tape. No, this is not a trick. Trim is not only easier to tape off, but it's also easier to follow when "cutting in." If you're the type of painter who doesn't bother with tape and prefers to freehand that nice, clean edge, you'll find it's easier to cut in when you can spread out your brush over a nice, broad area (the wall), and use just the edge to cut in along the fine line of the trim. the room is under construction. 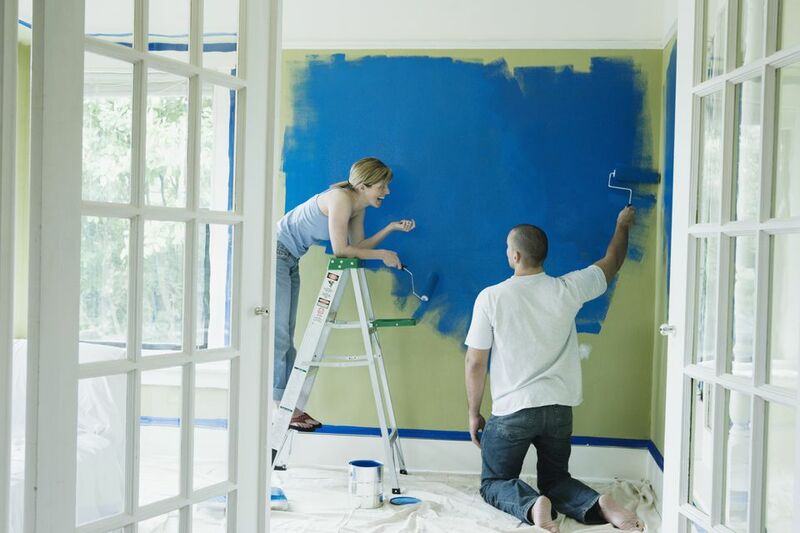 If work is still being done on the room, or there's a lot of work traffic through the room, you can buy yourself some time by painting the trim first. This leaves the walls for last, when (hopefully) there are fewer things moving in and out that can mark up the new wall paint. you want instant gratification. Sometimes you're just dying to see what the new color looks like, or you truly can't stand to look at that ugly old color for one more day. you're not committed to the wall color. Wall color has a bigger impact than trim color. If it turns out that you don't like the wall color, there's a good chance you'll change the trim color, too. No sense in painting both twice. you have unskilled helpers. Nothing personal, but, frankly, walls require less skill and care than trim-work. Walls are primarily rolled, while the trim is exclusively brushed and can look bad if someone slops the paint on, muddling the details and leaving permanent funky brush strokes. Once the kids or your lazy brother-in-law have helped you knock out the walls, take your time painting the trim yourself. Also, you won't have to worry about a sloppy wall-painter messing up your masterpiece.